Audrey – 25 months, wears glasses for farsightedness. The specs in this photo are Fisher Price. 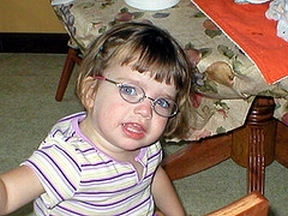 Audrey – 25 months in this picture, wears glasses for farsightedness. The specs in this photo are Fisher Price. They are gold-toned and have pink around-the-ear temples. (Barbie glasses bought at a local optical shop in Dallas, Texas). In between these, Aud’s had Flexon frames from LensCrafters, one pair of which she snapped in half.